Technically these are marketed as a “lash treatment”, filled with conditioning natural oils and ingredients, that just coincidentally is used like a gel eyeliner. They come in a little pot, are VERY moist, and are applied with a brush. The blue lips are partly to swatch my pretty new Fyrinnae lip lustre, and partly because i’m in just that mood where I don’t want to look approachable. ALso because the boyfriend picked the lip lustre out, and I’m amused to have a boyfriend who will seriously talk me out of highlighting my hair because “for the cost we can get you an AWESOME blue wig!”. I’m glad I’m not the only one who secretly loves tacky bright lips and hair colors. This isn’t really as blue as it looks in the full face shots. Its really more periwinkle purple. But its sort of blacklight style colors and I love it! I wish I’d done brighter lips, but i wanted to try my lip lustre with nuded-out lips. That technique doesn’t work, for easing the lip lustres uneven application. It still moves a lot, and it just means that the wear is a bit… odd…. with powder sticking to imperfections after the lustre has worn off. Oh well, worth a try. I liked how this came out. Today has otherwise been uninspired. I’m entering the worst time of the female month with a vengeance, and the past week has been nonstop crying, pain, spasms, and mood swings. So it took me three tries with unrelated colors to get something i wanted to complete. 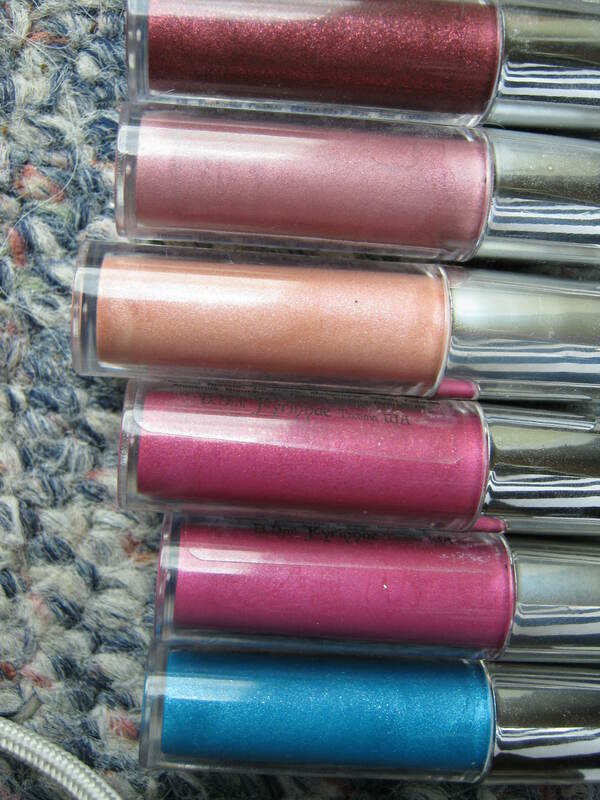 I took pictures in some different lighting to show the shadow texture and shimmer. Its GORGEOUS! Meercat may be my new favorite purple ever. I really want to try it with MAC Traxx(Traxx is more deep and eggplanty, but they both have an AWESOME gold shimmer with a rich reddish-purple, so it would be an easy and striking smoky eye) I do kind of want to try this with a less shimmery highlight color. You can see my brow bone crease in some of these pictures because wintersky isn’t blended lightly enough to diffuse the frost. I wasn’t as happy with this as you might think. I haven’t gotten a nice dropper jar for my mixing media, so many times I just put some on my brush, dip it in the shadow, apply, and discover I used too much and the thin medium causes my shadows to crease slightly before they set. I love the colors though. But I wish I hadn’t worked my shadows wet. There’s the slight creasing, and also the crease blending was a bit higher and sharper than I want. The story behind this is a bit of a long story. I was looking for a gift for a friend, loved the colors in this, though its not a particularly day-to-day suitable palette. But I thought it wouldn’t work as the gift because the colors are NOT for the faint of heart. Its marketed as kind of an “all in one” type thing, with very easy labeling of product positions, and a variety of well matched shades. We shall see how embarrassed I am to admit this but…. in the store, I convinced myself that I was going to buy this, for the cream colors that don’t match me. I convinced myself they’d make an awesome addition to the gift I was planning, and that made it OK to keep the rest for myself, since the stuff I picked out instead was (hopefully) a bit more matched to the woman I was thinking of. I can’t decide if my boyfriend thought I was insane for arguing that, or if he was just internally laughing fit to burst. Maybe a bit of both, knowing him. So, I was at a loss for what to play with first! This look was actually pretty easy. Used one new Fyrinnae color, and a lip lustre. The main colors though, are from my new dare to play palette. Review coming soon. I HAVE decided though, that I like the Fyrinnae Lip Lustres a lot more in practice, with a good coat of chapstick first! Another happy Fyrinnae order! Ordered the 12th, received the 23rd. So that was considerably less than their time estimate. Happy for me! So its been a while since I revisited this particular theme. And its been a hard week, all told, so I figured it was worth a redo. Remember-when working over the MUFE cream bases, use a lot of shadow to prevent creasing. I actually went over my color layers twice, only really blending the second time. 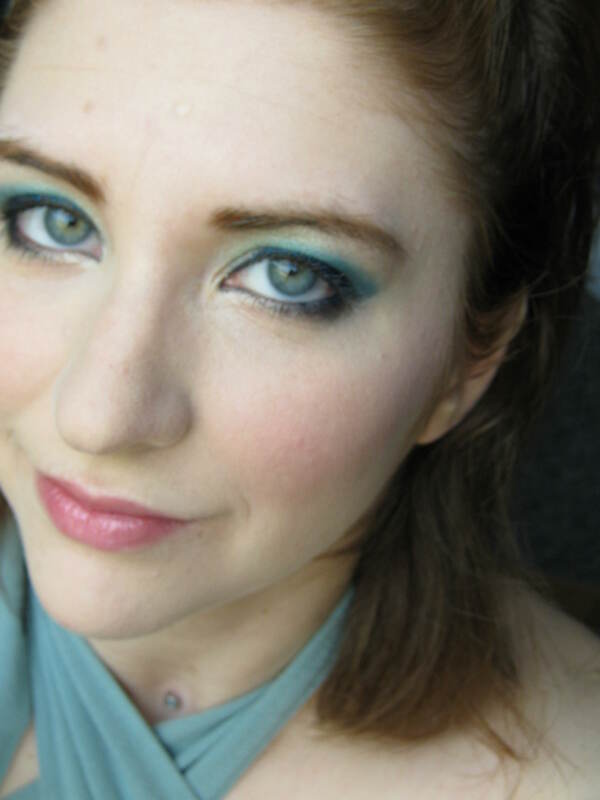 Also, I tapped the colored base on the lower lid, and then applied Primer to the browbone, and blended it downward, so it didn’t spread the coral tone to my eyebrows. 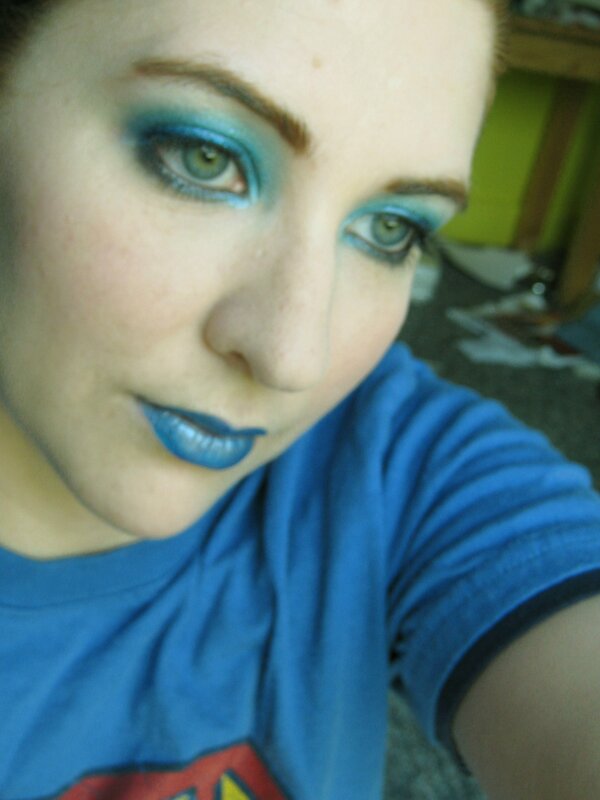 So when I was a teenager, I used to have a lipstick color, icy blue with a LOT of frost. My dad said I had corpse lips when I wore it. I wish I still had it. I ONLY wore it when I was in such a mood that even a polite hello would be seen as an invitation for me to get angry. After a few minor incidents, people VERY quickly learned that if i was wearing that lipstick, you did not want to EVER talk to me. Saved me a lot of headaches from getting angry at dumb things. 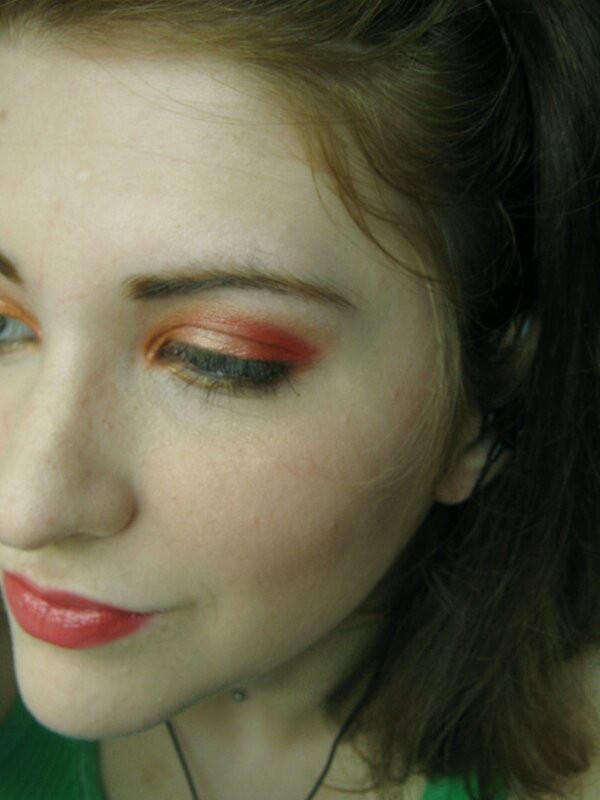 I sort of feel like that today, so I wanted to do makeup that would be a visual caution sign. 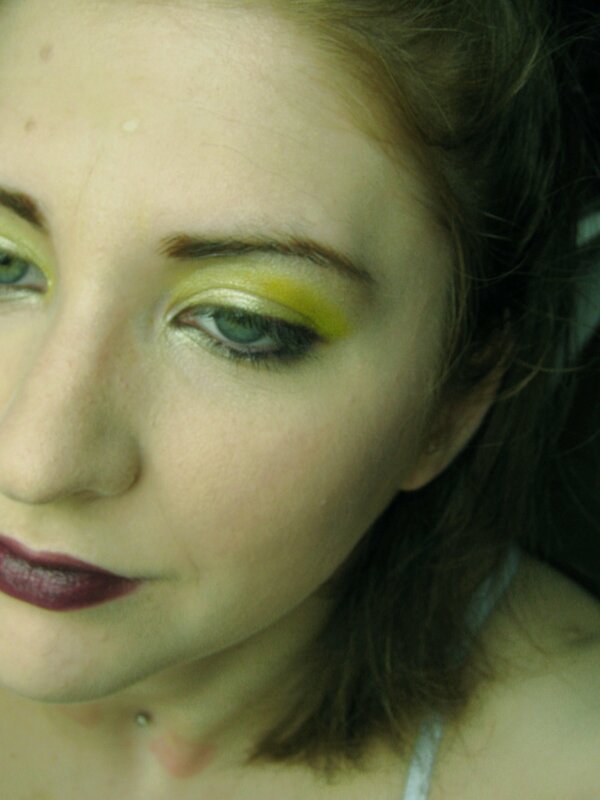 I don’t particularly feel that yellow makeup looks good on me, but the look isn’t really the point. I used purple lining, and lips, for a bit of contrast, and because it reminded me of the dirty iris’ my grandmother got in her yard when the yellow ones and the purple ones cross pollinated. The purple lips were a bad idea. My lips are really bitten and uneven, so the color would NOT apply evenly. I’ll probably wipe it off, and stick with MAC Hue for a natural lip.